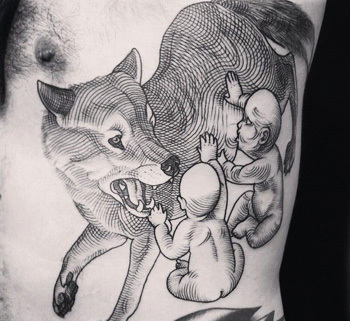 If you ask tattoo masters which subject for a skin decoration is ordered most frequently, they will probably answer unambiguously – a wolf tattoo. It comes as no surprise, since this animal hypnotize people for the ancient times, evoking not only fear, but a respect as well, and even admiration. 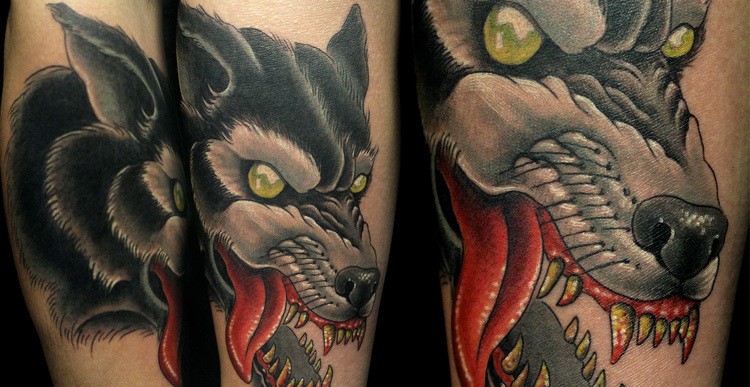 All this factors made wolf one of the most popular mage in the tattoo art. In myth, folklore and fairy-tales, wolf embodies fierce, treachery, cruelty, evil, along with bravery and victory. Apart from that, under certain circumstances, wolf can be presented as a powerful protector a weak creatures. One of the common subjects in Eurasian mythology is the theme of a tribe's forefather raised by a she-wolf. Many stories of the wolfs-progenitors can be named: the Roman legend of the Capitoline wolf, who rescued and feeded the twins Romulus and Remus; an ancient Iranian myth of the she-wolf, who took care of the Persian King Cyrus. The steppe Turkic tribes considered it to be their ancestoral totem, so they made flags and standards with a wolf head. A hero-forefather, a tribe leader were named "wolf" or the one who has "wolf head (body)." Wolf could be an emblem of the warriors and attribute of the God of War. Wolf was worshipped within the Roman cult of Mars and the Scandinavian cult of Odin. In the Hittite, Iranian, Greek, German and other Indo-European traditions often wore wolf skins to remind of the idea of the squad's unity. Walk is often associated with the underworld, standing for the souls' guide there. In Egyptian mythology, Wepwawet was originally a war deity, who later became one who opened the ways to, and through, Duat, for the spirits of the dead. One of his epithets was "Leader" and "the first warrior of Osiris," with whom he was associated. In Greek-Roman tradition wolf (sometimes a chthonic and three-headed one) was dedicated to Mars (version of Greek Ares), signifying dignity and victory. Romulus and Remus, kids of Mars, legendary founders of Rome, were suckled by a she-wolf. According to the story, the sacred animals of Mars – the woodpecker, the horse, the bull and the wolf – guided the young twins through the places, where the settlements should be arranged. An important Roman festival of Lupercalia, the festival of health and fertility, was also connected with the wolf cult. One of Apollo's epithets was "Lycian," that derives from Greek "lykos," meaning "wolf". In Scandinavian mythology, the central deity of Odin is accompanied by his animal companions – the wolves Geri and Freki, feeding all of the food on his table to his wolves Geri ("Greedy") and Freki ("Voracious"), since he himself needs no food and drinks only wine. Another giant wolf is situated on the western wall of Walhalla is Fenrir, shackled with a magic chain. As the prophecy says, Fenrir will turn against his carers, kill god father Odin and ravage the world. In Christianity wolf stands for evil, cruelty, cunning and heresy, devil that threatens to believers. It is only the saints who have the power to tame the fierce wild animal, as, for instance, Francis of Assisi, whose attribute became the wolf. This wolf terrorized the people of Gubbio. The citizens were hunting him, but when Francis met the creature, he referred to it as "Brother Wolf" and protected it as a true friend. In Slavic folk tradition wolf is connected with chthonic symbols, as the dead ones take his appearance or a wolf can bring the her to another kingdom or help finding treasure in numerous fairy tales. In Medieval heraldic wolf is mentioned in a positive sense, widely used in family coat of arms as a sign of liberty, vigilance and courage. Edward IV (the King of England, who lived in 1442 – 83) used a white wolf for one of his badges. Wolf is a part of a pack, conveying the principles of solidarity and unity. At the same time, this animal is associated with solitude, individuality and self-sufficiency. It is unlike the others, embodying borderline situations, the moments of overcoming. Hittites used to say of a person of the remarkable qualities or known for some great deeds: "He became the Wolf." In Ancient India the analog characteristics was even more laconic "He is the Wolf." Wolf howling on the moon tattoo – haughty solitude, independence from the rest of the society and night magic. Wolf with fire eyes tattoo – the most powerful of black magic, ability to transform your physical body into the astral twin. 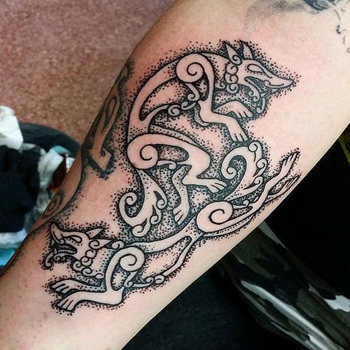 Jumping wolf tattoo – the symbol of overcoming any barriers and inner mightiness. Wolf within fire flames tattoo – this is a symbol of demon that can evoke and tames the darkest creatures. White wolf tattoo – a unique, outstanding personality, who is able to become a friend among foes, a foe among friends. A brave warrior and individualist. Running wolf tattoo – a nice sign for the lovers of extremal sports, risk and speed. But it stands for revengefulness and readiness to destroy anything that prevents you from accomplishing your plans. 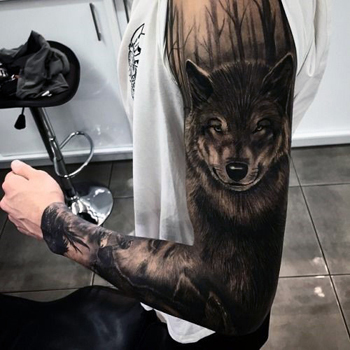 Wolf with a pack tattoo will suit to those, who wants to demonstrate his leadership qualities desire to protect all nears and dears. Wolf with bare teeth tattoo signifies rigidity, courage and fearlessness. She-wolf tattoo is a symbol of the justice and ultimate faithfulness, as well as revealing the tattoo's owner as a true freedom-seeker. When choosing one of those wolf tattoos, remember that any tattoo expresses the nature of its owner. So, whenever you decide to get the design with this elegant and noble animal as you talisman, be ready for the changes in your life! Art tattoo master have turned the whole human body into their canvases, experimenting with themes and compositions. 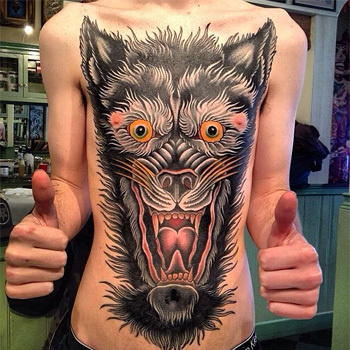 But still the approach towards wolf tattoos remains quite conservative. They tend to render them in large-scale designs that are applied on the spine. The can occupy space from the neck till the waist or (the smaller ones) the shoulder blade. But shoulder location is the most common. In this case there won't be enough space for an impressive big image, but it'll be easier to demonstrate the tattoo and the applying process is less painful. Many people prefer other location – on the chest. Other parts of body can also be decorated with this tattoo, but it's rather an exception than a rule.